The Team Academy programme of the HES-SO is revolutionising the education system by extending the Corporate Economist profile over three years. On the program: no more course schedule but training sessions planned by the teampreneurs (Team Academy students), more teachers but coaches who awaken the potential of each teampreneur, and 3 weeks of learning trip per year. After having gone into immersion in December in the Strasbourg Team Academy ecosystem, and having welcomed Finnish team members in January, the Swiss team members are currently in Spain to discover how Team Academy pedagogy works in the Basque country. A very dense programme was co-constructed between the two groups of students for this trip, combining cultural discoveries with knowledge and learning sharing. The teampreneurs arrived on Tuesday on site where they defined their learning objectives for this week of discovery. Wednesday was devoted to cultural visits, a creative challenge from Basque students and a visit to a cereal bar created from scratch by first-year students. On Thursday, the teampreneurs were able to discover in more detail the Team Academy program at the University of Mandragon by discussing it with several team coaches. In the afternoon, a Spanish company challenged the Swiss temapreneurs to offer this start-up practical solutions to expand its community. After visiting the Bilbao offices, the teampreneurs went to Ognate on Friday where other Team Academy offices are located. The teampreneurs will return to Switzerland in a few days, Tuesday, after a week of learning trip. The first year of Team Academy has just ended and a small retrospective is required. Monday, September 11 was the first day of the school year for the first 17 teampreneurs (students of the team academy) from Switzerland. After presenting the general program of the year, their coaches gave them their first mission: to organize themselves for their first dialogue and coaching session the next morning – their first awareness of the fact that they are actors in their training. The following weeks were devoted to the discovery and appropriation of Team Academy’s pedagogical model and its various tools. First training sessions (theoretical and practical workshops on a defined theme) were held on marketing, English, monitoring, project management and legal aspects. In connection with the “legal aspects” training session, the teampreneurs reflected on the legal form they wish to adopt in order to avoid their company. They then worked on their statutes, internal regulations and roles and finally registered their company in the commercial register under the name of “Andromeda”. 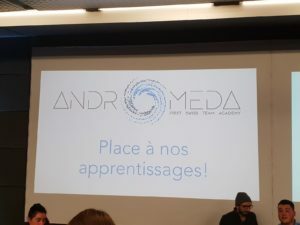 Within the framework of Andromeda, the teampreneurs carry out projects. It is one of the ways they can learn and develop skills. One of the highlights of the first semester is the organization of the “New Year of Entrepreneurs” at the Maison de l’entrepreneuriat. More than 50 entrepreneurs met for an evening organized by Team Academy students. 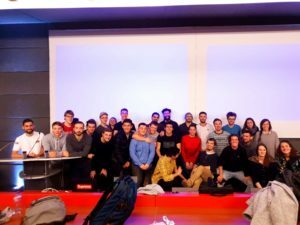 A first trip took place during this semester: the discovery of the Team Academy in Strasbourg (Bachelor Young Entrepreneur). Finally, their first evaluation took place. For them, the aim was to take stock of the acquisition of skills, not through exams but through a 360° evaluation (self-evaluation, by peers, by a jury of experts): a moment full of emotions. Find more information on evaluations in the news “How to evaluate without exams”. The second semester began on a high note with the hosting of Finnish students for a week. The objective of these 5 days was to compare the similarities and differences between the Swiss programme (the last launched) and the Jyväskylä programme (the origin of the pedagogical model), to discover a new culture and to lay the foundations for future collaboration between students. Several other learning trips took place during this semester: Bristol, Belgium, Bilbao and Amsterdam. Two projects marked this semester. 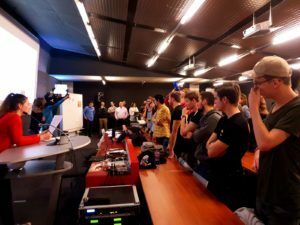 The first is “Apéro Urbain” which attracted more than 150 people for an evening at the Technopole de Sierre. 3 teampreneurs organised an outdoor aperitif in a friendly spirit that showcases local craft producers from the Valais region. The second is “Beblio” which organizes conferences in an original format. They have also won a partnership contract to organize 20 conferences in Sierre. 3 teampreneurs (Team Academy students), Pierre, Simon and Alexandre have decided to go to New York this summer to attend summer schools on different themes: business english, business administration, law and finance. Rhône FM has just published a news item on Team Academy entitled “Positive assessment after one year for the HES-SO Team Academy”. A second batch of 17 students will start their studies in the new academic year.